A citizen science platform that helps communities reduce the outbreaks of mosquito-borne diseases. A citizen science platform for 10 to 13 year olds that uses gamification to guide and encourage the collection of mosquito data, connecting local communities with scientists and public health actors. To stop the spread of infectious disease outbreaks USAID launched “Combating Zika and Future Threats: A Grand Challenge for Development”. The challenge called upon the global innovator community to generate cutting-edge approaches. As a result, Dalberg Design was brought in by USAID to conduct research and provide recommendations that could help make an existing piloted platform created by IGES into a more engaging digital experience for tween students. Focused on analyzing and understanding the use and impact of piloted app “Go Mosquito Habitat Mapper” in Peru. The research, served as a case study for the app’s potential impact for world-wide communities vulnerable to mosquito-borne diseases. Citizen scientists act as multipliers of knowledge in their families, neighborhoods and communities, engaging other stakeholders with the data. Stakeholders and communities use the collected data to, on the one hand, share it with the global scientific community and guide public health policy, and on the other, to influence local change in the community. Despite its benefits, all users found the app confusing to use, with too many complicated processes that were difficult to understand for children and parents alike. This confusion led to issues of data validity, incomplete submissions, and user disappointment. Ultimately, these insights led us to create initial prototypes and co-creation exercises that further explored the concerns and benefits of the app. Preparation for Research - planning and creating activities and prototypes for gaining feedback during in-country research. Synthesizing Learnings - synthesizing learnings from users and communicating findings in a co-creation workshop with all the stakeholders involved. Creating Final Outcome - developing the final concept and list of recommendations for the next version of the platform. The eventual outcome of the “Go Mosquito Habitat Mapper” app initiative is that public health actors can have access to data that can be used to provide the community with better services. Due to this, the goal of the app is to ensure the collection of and access to higher quality validated data. Furthermore, through the creation of the app we were able to enable and empower communities vulnerable to mosquito-borne diseases to become central actors in their city’s public health policy. Using gamification and citizen science, we engaged students, their families, and communities in the process of looking for and eliminating mosquito breeding sites. The community used the data to contact municipal government and change their local policy and community behavior. The high quality data was then provided to public health actors and scientists, and, served to help inform and provide better services to the community. 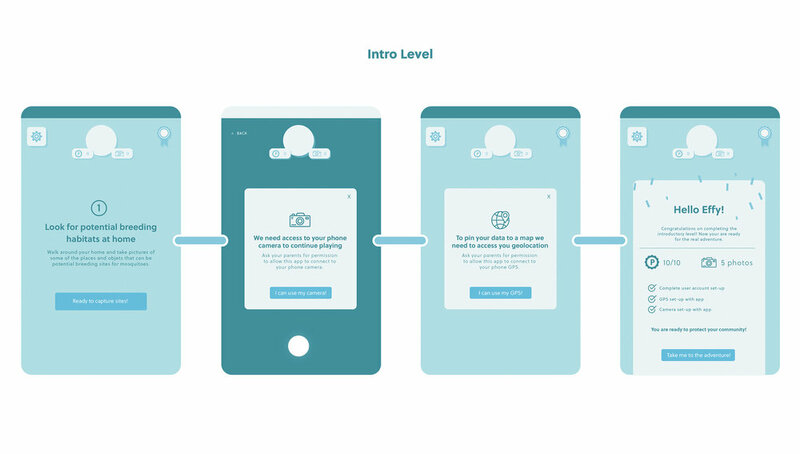 The mobile app for citizen scientists introduces a gamified experience to the data collection and elimination process while following a narrative on the app. The more data the citizen scientists collect the more points they receive to move forward in the game. The goal of the game is for the player to become the ‘Genius’ scientist by completing all the missions in the ‘lab notebook’, collecting all the medals, and having the latest and most advanced lab.